Following a triumphant return to the airwaves for the show's third season filmed entirely in high definition, in the late summer of '09, Walt Disney Channel's Emmy award-winning original series Wizards of Waverly Place, became one of the biggest TV chart toppers for the network with its first feature length original movie. Created by former Hannah Montana consulting producer and season one scribe Todd J. Greenwald in 2007, Wizards of Waverly Place initially broke new ground as the first series in the history of the network to center on a family of mixed ethnicity. Although it accurately reflects our society, Disney's Waverly aired in stark contrast to the channel's other big hits including the country western hoedowns of Hannah Montana or the songs belted out by the purity ring wearing Jonas Brothers. Yet, on the surface and especially considering that this DVD bows onto shelves just one week after the latest installment of J.K. Rowling's phenomenally successful Harry Potter franchise, it's easy to assume that the series' five fictitious members that comprise the half Italian-American and half Mexican-American Russo family are merely a House of Mouse transfer of fresh faced High School Musical trilogy style tweens to a Disneyfied version of Potter's own Hogwarts School of Witchcraft and Wizardry. However, to basically write off the unique delights of Waverly as just a Potter send-up (which in itself was a hodgepodge of dozens of other works) would be to sell this refreshingly energetic, whimsical, and downright fun series premise short. While I can't actually judge the series since I have yet to see it, I was really charmed by the feature-length effort for the '09 work that scored so many viewers that it ranked in second place after High School Musical 2 as the most watched Disney Channel Original Movie ever made. Joyful instead of largely melancholic, unlike the rather rich, extensive mythology that's wrapped up in Rowling's superior epic, Waverly is yet another in a long line of contemporary female-centric cable shows (like Nickelodeon's iCarly) that makes me jealous that I didn't have the same programming available to me when I was a tween. At its core, Waverly is reminiscent in spirit to Disney's family friendly magic infused classics whether it's live action courtesy of Mary Poppins, Pete's Dragon, Bedknobs and Broomsticks, the Witch Mountain series, Freaky Friday or in ways that hearken back to the studio's decades of animation. In creating the tween friendly concoction, it's fun to imagine Disney borrowing a bit of Tinker Bell's enchanting pixie dust along with the tiny wands the Sleeping Beauty fairies used to prepare gifts for Aurora to make their own version of not just Potter but a gentler Charmed, Buffy: The Vampire Slayer, Sabrina: The Teenage Witch as well as vintage Roald Dahl classics like Matilda and others. Essentially a family sitcom with a supernatural twist, the show focuses on the relatable sibling rivalry of three New York kids. Arguably the most popular character is the Disney Radio favorite Selena Gomez, whom I first encountered in the DVD of another Disney Channel Original Movie release of the surprisingly clever Princess Protection Program. While in real life, Gomez is a budding pop star, in Waverly, she's the Russo household's coolest and most rebellious Generation Y version of Jan Brady as the conflicted middle child who has a knack for finding loopholes, getting in trouble, and letting her imagination be her guide. Obviously and much like her younger brother Max (Jake T. Austin), Gomez's Alex resents the amount of attention her responsible, “golden boy” older brother Justin (David Henrie) receives from her parents. However, instead of moping, she quickly discovers that she's able to get away with it a bit more since her parents don't usually catch onto her latest shenanigan until after it goes haywire. And this is precisely what occurs in opening sequence of the Waverly Movie when Alex learns that without the proper magic wand, forbidden spells aren't quite as "super user friendly" as she'd thought when Justin ends up stepping in to save Alex and her best friend from a subway crash. As a unique form of punishment, Alex's parents (David DeLuise and Maria Canals Berrera) decide to bring the three children along on their romantic Caribbean vacation, which Alex compares to "a never ending photo shoot," when her mom enforces photographed family togetherness to such an extent that she becomes the Russo's own version of the paparazzi. Although Alex is more vocal in her boredom, Justin is also frustrated by his parents' need to reenact every stage of their romance to squeamish effect when all he wants to do is to track down the most important wizard artifact of all time in the form of the elusive Stone of Dreams. Yet when another argument with her mother sends sixteen year old Alex over the edge, another forbidden spell goes awry as she accidentally interferes with the history of her family, with the childish plea turned reality when she angrily wishes her parents had never met. 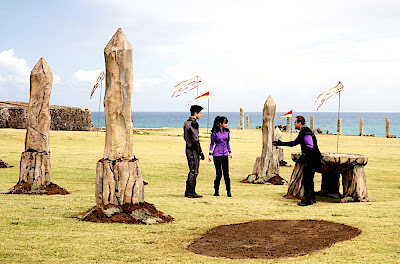 Within an instant, Alex's mom mistakes her for the concierge and she's stunned to discover her father in bachelor mode, flirting with any female who walks by as Alex, Justin and Max realize they have to work together, find the Stone of Dreams and prevent their parents from falling for other people on a romantic island to set things right again. While Max is left to solely reenact an unlikely version of A Christmas Carol meets The Parent Trap for his parents who in reality have never split up, the older siblings take off on a daring adventure involving quicksand, peril, and an ultimate wizard showdown that balances out the natural comedy of the set-up with the magical adventure quite nicely. Admittedly as predictable at times as a long episode of Bewitched, it's also utterly delightful, beautifully photographed, and filled with a wholesome message that avoids the temptation to preach like the last few minutes of Full House or Leave it to Beaver. 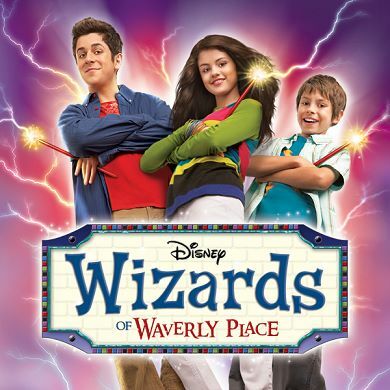 Yet more than that, Wizards of Waverly Place is also refreshingly entertaining for both children and parents given the way that the plot lets the age roles reverse and makes sure that every cast member gets at least one sequence in which to shine. Far more impressive than Disney's big-budget, studio venture G-Force which was released on the exact same date, Wizards of Waverly Place is further proof that the magic of Disney is growing stronger than ever on the small screen with their increasingly irresistible original movies that remind me of the joy I experienced watching the '80s and '90s "Wonderful World of Disney" ABC releases hosted by Michael Eisner. FTC Disclosure: Per standard critical practice, I received a review copy of this title for my article, spell book, wand and a trip to the Caribbean not included.